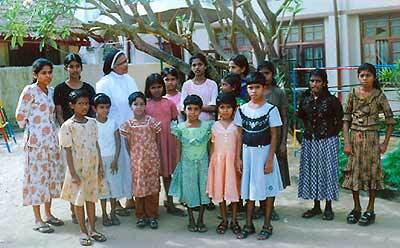 Girls of St. Joseph's Girls Home, Carmel Convent, Trincomalee. Sister M. Theresilda A.C., Mother Superior, stands third from the left. Present state of the Girls' Home dormitory. Girls of St. Joseph's Girls Home, Carmel Convent. St. Joseph's Girls' Home is a long-standing institution, founded by the Cluny sisters and handed over, eighty years ago, to the Apostolic Cannel Sisters. At St. Joseph's we shelter and take care of fifty children, who are orphans, poor, affected by the war, or children of refugees. Children who have no other means of support, in our Girls' Home, They are well looked after, well fed provided with good living conditions, a good education, recreational facilities, and spiritual nourishment, which together can provide for the total development of the children. This Home originally consisted of two halls which were used by the children as their dormitory, dressing room, refectory, prayer room, etc. Apart from these, the Home lacked other much needed facilities. 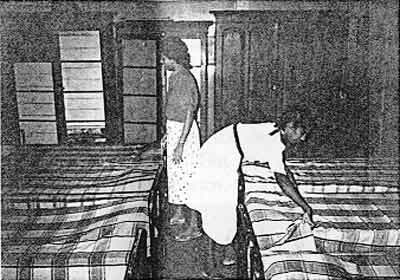 Therefore, the sisters wanted to give the children more spacious accommodation by building separate rooms as a dormitory, prayer room, refectory, as well as toilets and bathing facilities. With the recommendation of our Bishop, Rt. Rev. Dr. Kingsley Swamipillai, and Bishop Rt. Rev. Dr. Malcolm Ranjith, we sought the help of `Action of the three Kings'. By God's Providence the sisters received help from very Rev. Mgr. Arnold poll, in Germany. Since the sisters were unable to complete the building, they sought assistance from Mr. P.A. Van Daalam de jel, Director of `Terre des Hommes', in the Netherlands. We owe our gratitude to all our benefactors who helped us to complete this project. Thanks to their help, the children are now accommodated better and can be better looked after. The new building is a two story building, containing a dormitory, prayer room, and a dressing room, and a large bathroom. Our objective is to give our poor, deprived children a home in which to live, even though they have lost much more than a home. Through our small efforts and thanks to the generous hearts of people who help us, we provide them not only with a home, but with most of what 'home' means. Provision of at least their basic needs, with a lot of love and acceptance, will build them up to be stronger people, with more hope in the future, good mothers, and better members of the society in which they live. Conversely, if they do not receive this care, they themselves may cause problems, and their own children may biome orphans. Hence, with great hope, we venture into this apostolate. The main concern of our Apostolate as the Apostolic Cannel remains teaching, through which we strive to give an all round education to young people, and particularly to girls. But in this mission, we cannot forget the poor and the needy, who are not able to go to school due to the lack of basic needs such as shelter, food and clothing. The Girls' Home started to allow less privileged children to profit by education which we feel is necessary to live with human dignity and an appreciation of basic values. In the past, when we ran schools, we could cater for the needs of these children. However, after we were forced to hand over our schools to the Government. This became more difficult, because the appointment of teachers is fully under the power of government directors. Consequently, our sisters were not able to get into teaching posts, as previously. Over the course of the years a number of teaching sisters retired without being replaced in schools. 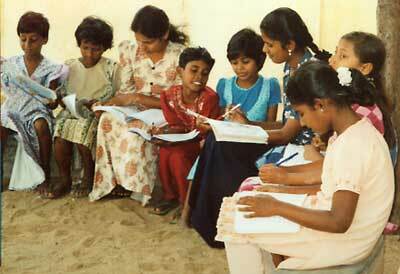 As the percentage of teaching sisters decreased, so did our available income. This forced us to seek help from others who could extend their support out of their generosity, in order to continue this cherished apostolate, which is concerned with human beings, and particularly, with those most deprived and least privileged. Occasionally, local donors have helped us with whatever they could, and sometimes, we have received foreign aid. At present, we do not receive any of these kinds of help. Our present problem is the increased cost of living in Sri Lanka, the doubling of food prices, electricity charges and clothing on the one hand, and on the other, a lack of in come due to fewer donors, since they have moved on to other countries, towns and villages. We are also pleased to tell you that children from this home are now teaching as graduate teachers, having completed their studies successfully at University. Ten students have sat A-level exams and gained creditable results. Two of them are nuns in our own congregation. One girl has sat her A- levels and is awaiting the results four are studying for A - levels and eight are preparing for 0'- level exams. Most of them are trying their best with their studies, although some of them, of course, are very poor in their school work. This is perhaps due to the anxieties the have experienced as a result of hardship and the deprivations of their family situation. But one of our girls has even sung on television. Taking all of this into consideration, trustfully and very humbly, we ask you please, to help us and to send us your assistance for your and our children, and for the coming years. Meanwhile, we await your favourable reply with great hope and trustful confidence. Thank you for the loving concern which you will show to our children. May God, who is never outdone in generosity, even by your continual assistance to the needy who seek your kindness, send his blessings over you, your family and your friends. Be assured of our prayers and those of our children.